Amazingly, remnants of a 300 million year old jungle were recently found deep beneath the flat, blacksoil Illinois landscape not far from where I used to live (Champaign), in nextdoor Vermilion County. Remnants of a 300 million year old jungle were found by coal miners working no more than a 45 minute drive away from the University of Illinois. "It covers about 15 square miles, all more than 200 feet below ground, and probably is the largest intact rain forest from that period ever studied, according to Scott Elrick of the Illinois State Geological Survey." "'It's that scale that makes what lies just above the Riola and Vermilion Grove mines significant,' he said." "'We never encountered one whole forest preserved in one shot like this,' Elrick said Monday. 'The fossils just didn't stop." 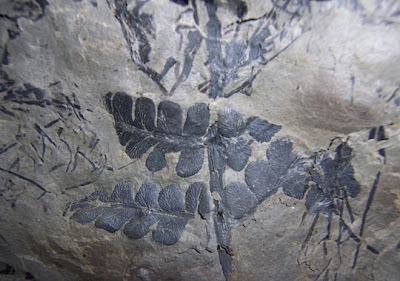 "It's common to find small pockets of fossilized plants just above coal mines, he said. But in this case, experts believe, a fault that runs through the area unleashed a major earthquake that quickly sank the forest beneath a deep layer of mud, preserving it." Read the full article here, via the Discovery Channel.